I had the opportunity to do some traveling this weekend. I spent Saturday at Lake Anna with some old friends at an incredible lake house. Sunday I spent the day with some college friends in DC, and on Monday I got to see my cousin who is living in Raleigh. The weekend was a great time, and I also did a ton of driving. 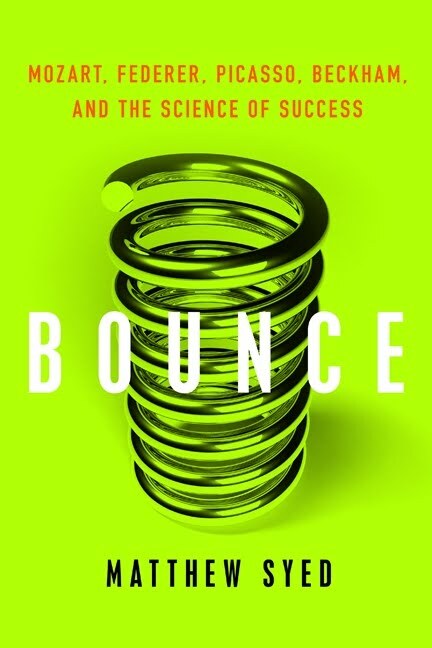 During the drive I had the chance to listen to a book that I have been looking forward to: "Bounce; Mozart, Federer, Picasso, Beckam, and the Science of Success" by Matthew Syed. 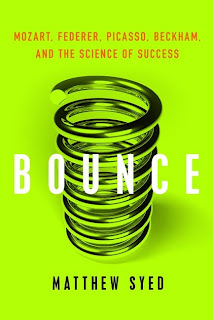 The book was phenomenal and anyone who read and enjoyed Malcolm Gladwell's "Outliers; The Story of Success", you will love Bounce. It takes some of the main concepts from Outliers, such as the 10,000 hour rule (my favorite chapter) and expands on the topics while adding additional insight, ideas, and real life examples. It is a study of successful people in all types of fields (athletics, chess, business, etc) and how they are created both by their physical efforts as well as how they think; their mental toughness or beliefs. I strongly recommend it for summer reading, and I will add it to the recommended reading list below.